Today kicks off a big week! 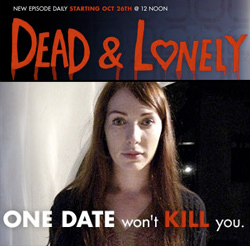 At 12pm EST IFC releases the first episode of “Dead and Lonely,” (Youtube playlist here) a new web series by Ti West. I composed some fun Tangerine Dream / Vangelis inspired synth music for it. There will be a new episode every day all week long! It’s a realistic look at the perils of online dating and vampirism… The series features a real online dating service, Date Or Die, which you can actually check out at dateordie.net (be sure to watch the testimonials).